This 120-acre farm in the Umbrian countryside of Northern Italy had been dormant for 40 years prior to its acquisition in 2000. The new owners from America considered many options to make the land self-sustaining before they settled on winemaking. 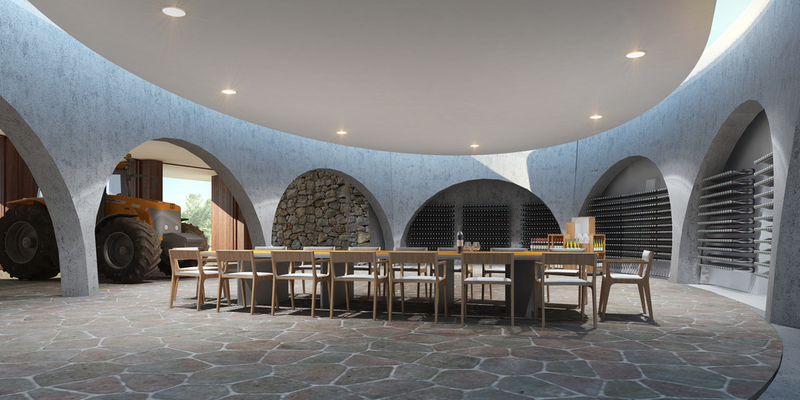 In support of that decision, this structure is intended to house the farm equipment, but more importantly to be a gathering place where the wine can be stored and sampled. This oval space has a continuous skylight at the intersection of roof and wall that creates a constantly shifting border of shadow and light. The atmosphere is intended to be sophisticated yet simple and rustic. In addition, a small apartment unit houses several of the seasonal workers. Stringent local regulations restricted the architectural characteristics of any new construction. Only a third of the exterior walls could be above grade. 50% of those exposed walls had to be clad with local stone. In lieu of the proscribed clay roof tile we choose to plant the roof in local grasses and flowering plants and appealed to the local building officials for relief.